Fig. One of a very few photos without any rock on it. We had enough money to buy petrol and some canned food, though not enough cash for commercial camping. Fortunately, we have found a nice, secluded place on the outskirts of the town. Fig. Asia and Tomek found a new home. The main objective of the trip was to lead as many routes as possible. 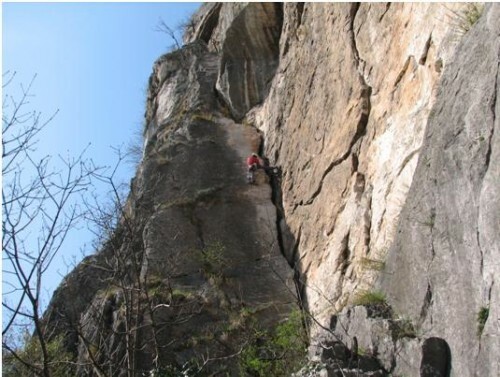 As it was the beginning of the climbing season and our climbing shape was far from excellent, the most of the routes we did weren’t very hard… except one. I’m talking about the highest crag in the area – Colodri. Some of us got goose bumps looking at this huge wall. That’s why we had to try. We didn’t have much experience with the mountain climbing (we still don’t), so it was a big challenge for us. Fig. On the third pitch my knees started to shake. Yeah, the weather was excellent, so the girls decided to take a sunbath. Fig. Tom at the finish of the traverse. Fig. A little bit less happy, but still fresh. Fig. The hardest pitch on the wall; Tom is leading the way. Fig. The state in the middle of the route. Fig. Top of the crag. I was really tired. Our plan was to make it in 3, maximum 4 hours. “Our plan was to make it in 3, maximum 4 hours. After three hours of climbing we were only halfway through. Altogether we spent 6.5 hours on the wall. But the satisfaction was huge…” Wow. It tooks 30 minutes to get down, couse we’ve chosen more comfortable way – foot path on the other side of Colodri. Do we have stairs in CodeTwo HQ??? Why didn’t you tell me? Smart guy…try to type some source code of CodeTwo Postman wihout a climbing powder. Did you skydive on your way down? Why didn’t you use stairs to enter CodeTwo HQ today? Wake up man! You don’t have to use a climbing powder anymore when typing!!! Question no.1: I assume you never look down while climbing, do you? Question no.2: It took 6.5h to get on top of this mountain. How long did it take to get down?